We define “populist” parties as those that display high levels of anti-elitism. We do this on the basis of the Chapel Hill Expert Survey. For all countries but Denmark, we rely on the 2017 CHES. This survey, which was carried out in January and February 2018, asked 228 regional experts to evaluate the 2017 party positions of 132 European political parties across 14 European Union member states. CHES results are regularly used by academics to classify parties with regard to their left-right ideological leanings, their key party platform positions and their degree of populism, among other things. Measures for Denmark come from the 2014 CHES, as this is the most recent year that Danish parties were included in the survey. For all countries but Denmark, we measure anti-elitism using an average of two variables in the CHES data. First, we used “PEOPLE_VS_ELITE,” which asked the experts to measure the parties with regard to their position on direct vs. representative democracy, where 0 means that the parties support elected officeholders making the most important decisions and 10 means that “the people,” not politicians, should make the most important decisions. Second, we used “ANTIELITE_SALIENCE,” which is a measure of the salience of anti-establishment and anti-elite rhetoric for that particular party, with 0 meaning not at all salient and 10 meaning extremely salient. The average of these two measures is shown in the table below as “anti-elitism.” In all countries, we consider parties that score above 7.5 as “populist.” In Denmark, because PEOPLE_VS_ELITE was not asked in 2014, we use only one question: ANTIELITE_SALIENCE. Additionally, because no party scored above 7.5 on anti-elitism, we include the highest-scoring party: the Danish People’s Party (6.9). We also considered CHES’s “FAMILY” variable to further classify populist groups. Per CHES, “family attribution is based primarily on Derksen classification … triangulated by a) membership or affiliation with [European Parliament] party families, b) Parlgov classifications and c) self-identification.” As this question was not asked on the 2014 CHES, we do not have family classifications for Danish parties. We can further classify these traditional and populist parties into two groups: left and right. When classifying parties as left and right, we relied on the variable “LRGEN” in the CHES dataset, which asked experts to rate the positions of each party in terms of its overall ideological stance, with 0 meaning extreme left, 5 meaning center and 10 meaning extreme right. We define left parties as those that score below 5 and right parties as those above 5. 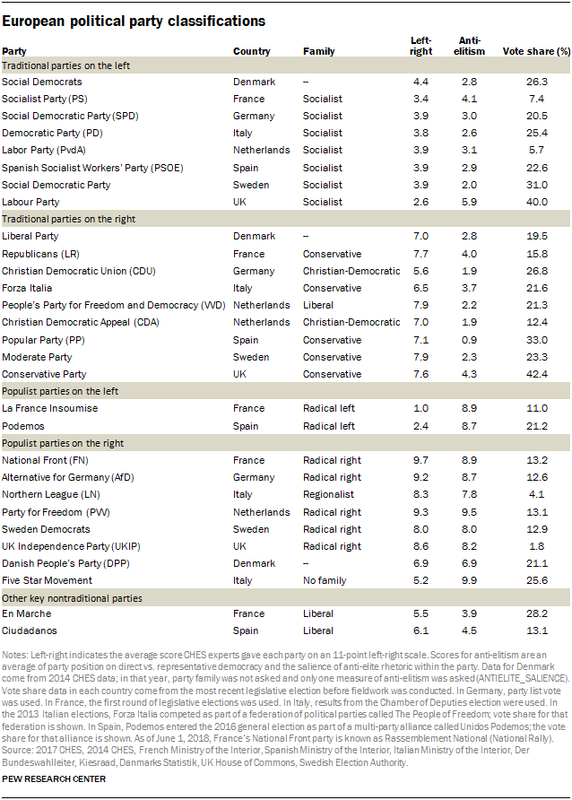 Most traditional parties fall between 2.5 and 7.5 on this scale, while most populist parties fall outside this range.